As an Alaskan blogger, I feel obligated to post stunning scenic shots of the Last Frontier. There's just one little bitty problem. April is about the worst time of year for capturing anything remotely pretty or colorful. Big, wet snowflakes started to fall about 30 minutes ago. Big, wet snowflakes falling amongst barren, leafless trees . . .
photograph this gorgeous landscape? No? Well, how about this . . .
At least the sky is blue in this shot I snapped last week. 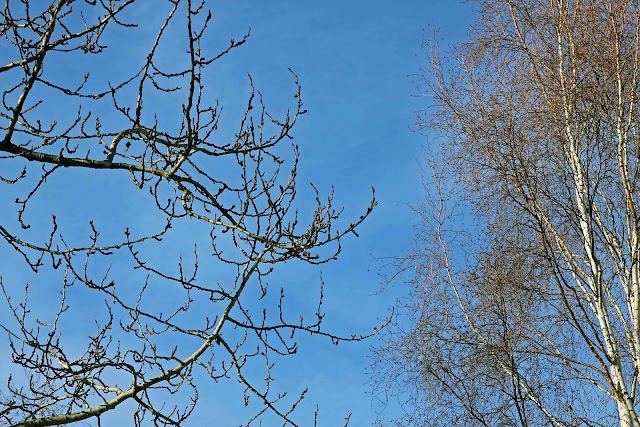 looking at those bony tree fingers silhouetted against a cloudless sky. Maybe a couple of cute kids will help my photography . . .
good mud puddle when you see one? Here, I guess this will have to do . . . When in doubt, post a picture of a moose. I don't care what anyone says. Those pictures are fantastic! When does spring come to Alaska? And I think that a picture of a moose is good anytime. 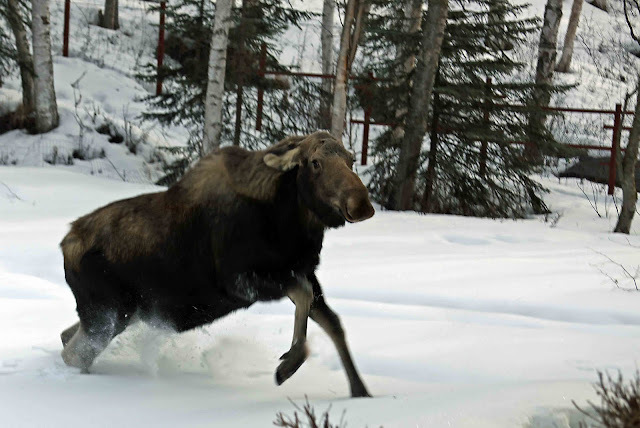 Great moose shot! And, I love the blue skies too. We sure do get some brilliant blues, don't we? honestly you could post any photo of Alaska and I'd think it was pretty. Dave and I have been there twice and we love it. He's more of a city guy, but I could absolutely see myself living there. I think when in doubt, post a picture of a moose will be my new catchphrase. Over from Karen's - nice to meet you. I'll be back for more photos. No pressure. I came over from Karen's blog. I love all the pictures, even the first one. Great job. Come visit me any time. I blog in 3 places. Stopping by from Karen's blog today. I think the snow picture is gorgeous! The muddy road leaves a little to be desired, no? But you know you had me with the first moose photo I ever saw here! OMG the picture of the moose is classic! The look on his face says it all...that's a total "oh crap" face if I've ever seen one! Gorgeous pics, as always! 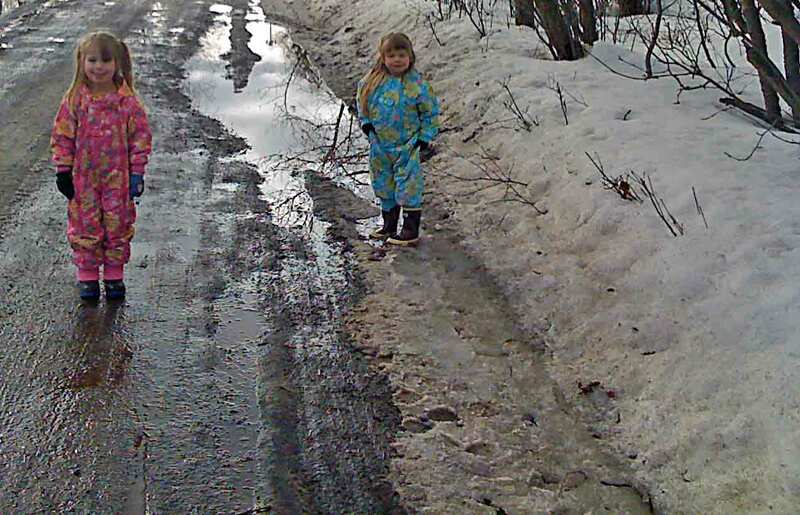 Love the pic of the girls standing in the muddy snow!! 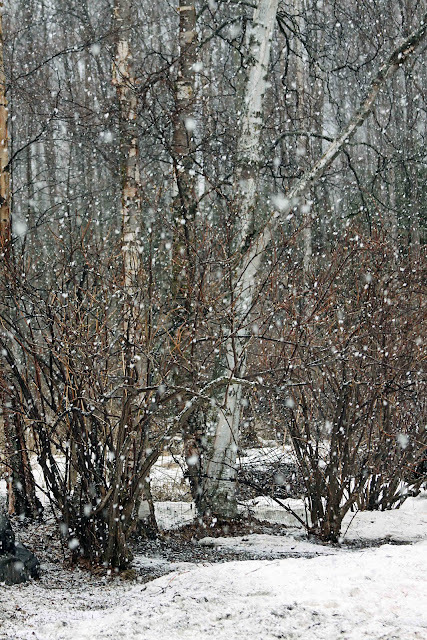 I lived in Fairbanks for awhile when I was a kid, so those pictures brought it back to me. I actually love the one of the big fat wet snowflakes in amongst the bony fingers of trees. Very nicely done. And the moose is classic.